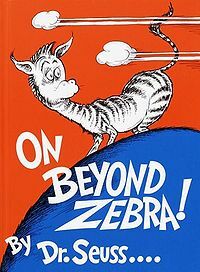 We love Dr. Seuss in our house and one of my favorite Dr. Seuss books is "On Beyond Zebra" in which the young narrators teach Conrad Cornelius o'Donald o'Dell that the alphabet doesn't stop at Z. “That I never could spell if I stopped with the Z. “My alphabet starts where your alphabet ends! He introduces many wonderful new creative letters such as Yuzz as in the Yuzz a ma tuzz and Humpf for the Humpf-Humpf-a-Dumpfer. Link to your reviews. 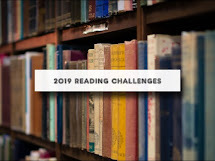 Perhaps provide a half way there update on where you are in the challenge. Plus, let's make this a bit easier. If you have multiple reviews for the week, provide a link to your blog with (multi reviews) in parentheses after your name. I may not be halfway just yet because I got little behind on Little, Big, but I am plugging away! Please email me a picture of the Flunnel. I could find pictures of all the animals online except that one. What you see if what you get. Sorry! Oh well. That does it. Where did you get your copy?